Osmena said that he actually does not care if Gov. Marcos runs for Senator or not. It does not make a difference in his bid. He just wants to make sure that the martial la atrocities that he knew won’t happen again. There have been different sides of that story from the alleged victims and the law-abiding citizens. Activists who rebel definitely had the worst days of their lives. This is very different from the rest of the Filipinos who contribute in their own simple way to build a worthwhile community for themselves. Osmena is right that it is up to the Filipino people to continue the reforms after a bloodless revolution but they might be fighting for what they do not like when the mainstream media is out there to mislead them. if this is not the case, the main personalities who are involved in the mutiny should not insist that it was just a mutiny and not as many perceive it to be. Another candidate from the opposition rides on the popularity of Imee Marcos. I his campaign sorties, Diokno said that he finds young voters listen intently. “They want to know the truth and they are learning so fast how to discern between fake news and what’s really true,” he said. The Otso Diretso slate challenges their rivals from the administration ticket to a debate recently. 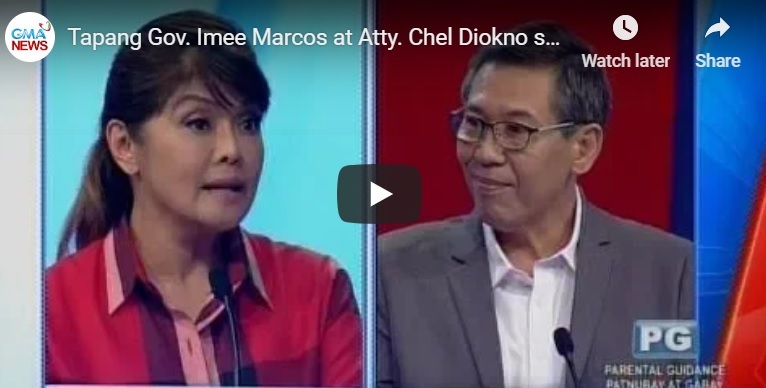 “I really wanted to debate with Imee Marcos. We have to thresh out so many issues. Their camp has been saying so many things. The records are there, the facts are there. It’s unfair to revise history,” he said. Diokno would tap social media and continues to campaign through debates. He refuses what he describes as a “tarp war.” “The Senate is not about making tarpaulins. The Senate is about making laws,” he said. Diokno said the public should care about the anniversary of People Power, even in the face of a resurgent Marcos family. “The freedoms we enjoy would not be here if not for EDSA. Some people forget that,” he said. However, many Filipinos are now aware of the anti-Marcos propaganda that led the country to chaos during the double Aquino regimes. The Liberal Party members are aware that their existence is dying. Their so-called democracy also died allegedly when President Rodrigo Du30 becomes President. Needless to say, the Marcoses become stronger after 33 years of the so-called Edsa Revolution. When Imee Marcos becomes Senator in 2019, get ready for Bongbong Marcos as President in 2022.